Click the button below to add the Fish Fry Combo to your wish list. Lemon dill fish seasoning, crispy fish batter, lemon and cracked black pepper fish seasoning. 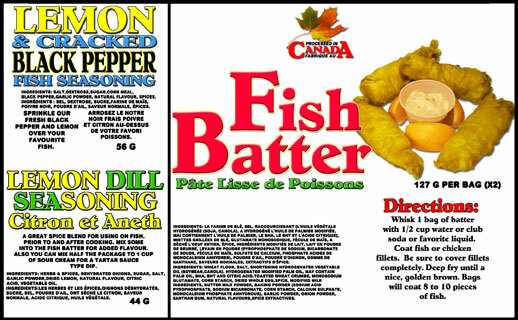 Ingredients: lemon dill fish seasoning, crispy fish batter, lemon and cracked black pepper fish seasoning. It's nice to be able to control the amount of batter you get on fish, especially for deep frying. This is really tasty, light and crispy. My husband only eats fish and chips at restaurants and he was really pleased!